ARR tested a Ducati Multistrada Granturismo for a year, riding over 14,000km in all kinds of conditions. How good was it? What did we learn? Did we like it? Check out the video and read the review to find out. This is not a moment I’ve been looking forward to. I’m about to head to Fraser’s Motorcycles to return the Multistrada after a year’s “ownership”. Losing it will be a bit of wrench because, against my professional will, I’ve fallen for the Ducati. It has been an ideal companion for 12 months and thousands of kilometres, over which I’ve learned just how brilliantly conceived and executed this real all-rounder is. It’s not an Italian thoroughbred, it’s an Italian stockhorse. Thoroughbreds are silly things, but stockhorses are fine, strong beasts. More than any other Ducati, and more than the vast majority of other motorcycles, the Multistrada is the best of everything. In Granturismo form, it’s a genuine touring bike, a real sportsbike and a proper all-roader all at once. On the eve of the arrival of the updated 2015 model, with its variable valve timing and other upgrades, it’s time to review the Multistrada after its long-term test. First, let’s get to the elephant in this room. The Ducati’s complex electronics did suffer a couple of glitches, but glitches is all they were and nothing failed. The bike never broke down, the rider’s aids worked flawlessly and the Skyhook semi-active suspension behaved superbly. Once I had to wait while the ignition mysteriously refused to respond to my efforts on the starter switch, but then suddenly all was right again. The left indicator continues to frequently activate the hazard lights, which I’m told is a flaw in the programming, and the neutral sensor system isn’t working properly, probably because there’s grit in the sidestand switch, but I haven’t confirmed that as pumpkin time looms over the bike. A coolant weep needed attention but there’s nothing in the bike’s year- long life so far that has made me think Ducati isn’t on the ball with build quality and design. As a result, I’ve been able to immerse myself in the Multi’s rich attributes. At least, I could once I was also immersing myself in the plush attributes of a Cruis’n Comfort sheepskin seat cover because the Ducati’s own perch was a wee bit firm for my poorly padded backside. Skip forward to now, with 16,000km on the odo, and the other thing that gives me confidence is the way the bike has come up after a few hours of cleaning. It has always been garaged but then again it has ridden dirt roads every time it has left home. It has been covered in mud, caked in bugs and slimed in city grime, yet it freshens up nicely every time I give it a basic wash. Now, with a bit more effort, it looks as good as new. It has a couple of little scars, as you might expect, but it’s hard to protect against rock strikes and the like. The Multistrada is defined by its electronics. The process for altering the root settings of electronic engine, suspension, traction control and ABS modes was not something I managed to commit to memory. Or rather, it’s not something that stayed in my memory after my initial flurry of experimentation with the system. Later in the year, if I wanted to make changes I usually had to pull out the owner’s manual and follow the instructions. A smarter mind than mine might not need the guidance, but I did, yet with the book under the seat it was all too easy o pull it out and tweak the controls. Certainly quicker than pulling out tools and tweaking physical components. And because it was so easy, I never hesitated to use the system to my advantage. A moment of sudden clarity revealed I didn’t have to abide by the rules implied by Sport, Touring, Urban and Enduro, such is the scope for adjustment Ducati has provided. Of course, they’re four pretty desirable sets of attributes, but as I don’t live in town I was better served by turning Urban into my default night- time Enduro mode, as I discussed a couple of issues back. After a year, though, did my attitude to all this electronic adjustment change? I went into it knowing that I’d like the ability to quickly adjust preload and damping setting to suit solo riding, the added weight of luggage, more weight again with a pillion or the maximum load of being two-up with luggage. I mean, who ever bothered adjusting all that manually, except perhaps before and after a major tour? So yes, those electronics are excellent and well worth having. But all the rest? I suspected I might find little use for them and conclude they were novelties, but in the end I loved them. Not only were they good for fine-tuning the bike to my tastes and style, they were essential for enabling the Multistrada to release its full potential as an all-road sports-touring bike. And in the context of sports- touring, there’s firm emphasis on both words. As a sports bike it’s huge fun. The power and response are exhilarating. No, not Panigale exhilarating, but I’ve ridden Ducati’s full-on superbike and reckon it was too much for the road, a bike that was all or nothing to an extent that I couldn’t enjoy it. The Multi in Sport mode, though, was my cup of speed. It’s light enough, tight on the road, pulls power wheelies out of corners and skims footpegs when you crank it right over. Switched into Touring mode it was calmer, just right for eating miles. Often I’d flick it into Sport for a while, especially on a winding road where the firmer suspension set-up makes a difference, but mostly I left it in Touring. When Urban mode still had its urban setting, I would choose it on a wet and slippery road, where the gentler power and more reactive traction control and ABS gave ample reassurance, but once I made it my alternative Enduro mode I was happy with the way Touring’s standard settings dealt with dodgy road conditions. It’s true that the Multistrada is not a competitor for the mighty GS BMW as an off-roader. It’s not just the 17in wheels, it’s in the suspension and steering geometry too. I didn’t try to treat the Ducati as a GS, either, but I never shied at punting it along any unsealed road. That’s what it’s for, after all, and there it was fantastic. The ABS and traction control are ideally matched to the Ducati’s chassis, and I had enough trust in the bike to dial the TC settings to minimum and enjoy the way the back end would slide a certain amount before the electronic limiter kicked in. I could have turned off the TC but wasn’t really tempted to bother. Ditto the ABS. Oh, the loud clack of the forks topping out on rough roads? I haven’t mentioned that all year because even though it happens often, the earplugs I always wear drowned it out. The noise is a result of the design and cannot be stopped, but no harm is being done and if you can’t hear it, who cares? I didn’t. Without this 12-month test I don’t think I would ever have fully appreciated how beautifully the Multistrada lives up to its name. It takes more than a road-tester’s typical week or two doing maybe a couple of thousand kays to fully understand the breadth of this bike’s performance. The more I knew, the more it grew on me. In fact, I enjoyed it most of all on the very last long ride I took it on, more even than the first fun fling when I was filled with the novel joy of having it all to myself. By the end I was really making the most of it. I took more detours and didn’t hesitate when the road surface changed, just pressed the button to switch modes and hooked in. Every Multistrada owner I’ve spoken with has been stoked by their bike. I am not surprised. I can see why it has won over many former BMW owners (and why BMW has built the new S1000XR). Buy this model second-hand or buy the new 2015 model, which promises to be better still, but either way you’ll be seriously impressed. It’s not a Panigale, it’s not a Goldwing, it’s not an Adventure, but the Multistrada Granturismo fills the vast triangle formed by all three and therefore fulfils the desires of anyone who wants the ultimate, classy, do-it-all bike. Ducati added a number of components to create the Granturismo, the Multistrada’s top- spec model. They make it a more robust and tour-ready motorcycle. Most obviously, the top box adds valuable luggage space. I rarely removed it, even though a single turn of the key and press of a button releases it from its mounts. Whenever I travelled, I usually had a laptop and camera in my load so the third hard case was invaluable for space as well as security. day; the lower bars on the Touring model would eventually leave a knot between my shoulder blades. The fog lights were good in the fog, where they’re bright enough to make you visible from a greater distance. A Multi-owning mate, Ross, described the GT as ugly, mainly because of its crashbars. But when one of my P-plating daughters knocked his Ducati over (arrgh! ), the damage was much greater than when a freak squall knocked over the Granturismo (arrrgh!). The crashbars worked. For me, doing the miles I do, opting up to the Granturismo is a no-brainer. at 12,000km. Fuel consumption had averaged around 6.0L/100km, though I didn’t keep a record through the year; the range from tankful to tankful varied between 4.9 and 7.3L/100km so you can see it’ll vary a lot depending on your riding style. The only other running cost was a set of tyres, replaced when the rear wore out at 8000km. The second rear tyre was beginning to square off and wear down another 8000km later. 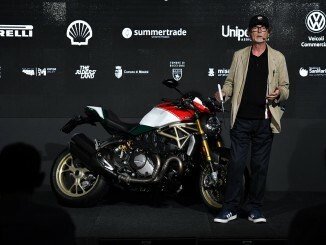 It’s a cheap bike to run, in other words, and shows how much Ducati has come to the party regarding ownership costs. The quality of life and long distances with the Multistrada were definitely improved by the semi-active Skyhook suspension. The ever-changing, reactive damping mechanism adds smoothness to touring and control when you’re hammering it. It does add a fair bit to the price of the bike. The base-model Multi doesn’t have it and if that’s where your budget tops out, you’ll not regret the purchase. If you have the money to spend on any of the Skyhook models you shouldn’t hesitate. The more miles you clock up, the more you’ll be glad you got it.